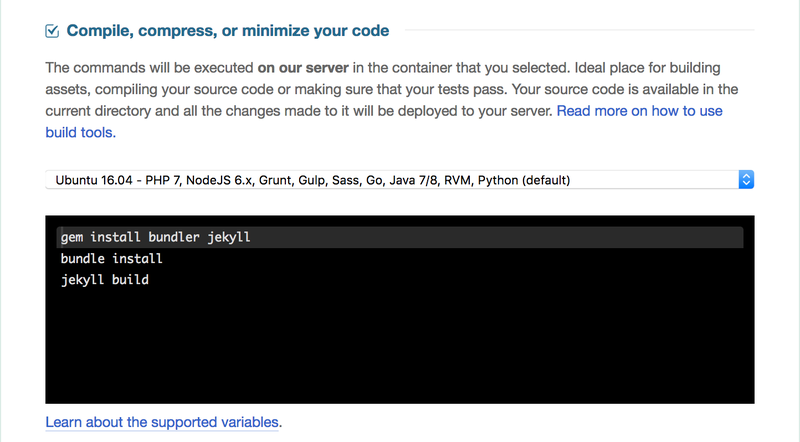 DeployBot’s default Docker container and build tools make it possible to build and deploy Jekyll sites. This allows the _site directory to stay out of your repository (in .gitignore). The site's assets build during the deployment. As a note, these instructions include using Bundler, a dependency manager for Ruby. DeployBot will then build a Jekyll site, outputting the site to the _site directory and deploy the contents of your repository to your server. Want to keep the Jekyll _config-file.yml file out of your repository? Use DeployBot’s configuration files to use the file during deployment. If you'd like DeployBot to compile your site, but only deploy the _site directory that's possible. In the Advanced deployment options, set Source to _site.